How do you document a route plan? How can you use Google Earth to check the route and save pics of critical navigational decision points? 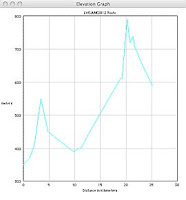 How do you use mapping software to plot and export the waypoints to your GPS, print the route and elevation graph? How can you annotate your map pdfs? How do you protect your maps from the weather? The first step in planning any trip is to read guide books, talk to other bushwalkers and search bushwalking forums, websites and blogs to discover which routes are popular. Once you have decided on your intended route you will need to check water availability, weather conditions, locate existing tracks, property boundaries and permitted camping spots. Don't forget to check photographic websites such as Flickr, which give a good idea of popular sites and the scenery to be expected. Next study the terrain to work out your likely speed, keeping in mind height gains and losses, the density of vegetation, the amount and difficulty of any off-track walking, and the presence of waterfalls in creek lines, which may need to be bypassed. Once you know these you will be able decide how far apart your camping spots can be and determine each day's starting and finishing times. I have discussed many of these navigation techniques and route plan design in previous posts (21) and won't go further into detail now. You should never rely solely upon a GPS for critical navigational decisions and for this reason bushwalkers should always carry topographic maps covering the route, and the surrounding countryside just in case you get off track. These can be purchased from a local map or outdoors shop, and are usually available at 1:50,000 scale but sometimes at 1:25,000, which provide more detail, for popular areas. If you are walking the Heysen Trail in South Australia, there are two excellent guide books (Northern and Southern), with log books readily available available which include maps that are adequate for most walkers. The CFS also publishes (Mapland) excellent map books, and these too are available from map and outdoor shops. Many downloadable walking brochures for our parks are available from the Department of Environment's Parks SA website. With digital maps readily available, many people are using mapping software to select just the relevant parts of maps and to enlarge these beyond the 1:50K scale than is usually available in printed maps, making it easier to see the contour and creek lines. If you are lucky enough to live in NZ, you can download 1:50,000 maps free of charge and even Australia has 1:250,000 maps for free download from Geoscience which are useful for getting the big picture and planning access roads. My apologies to Windows users for the following Mac centric discussion. One big advantage of mapping software is that it is possible to enlarge the map on screen to locate the exact position of known waypoints or to determine the grid reference to 7 figure accuracy of any point you can see. Once you have decided on your waypoints you can rapidly link these to form a route, calculating distances and bearings automatically by dragging from point to point, and plotting a route elevation graph by selecting the route single click. 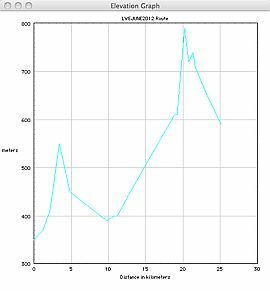 The elevation graph is useful for estimating time to be taken. The disadvantage of using a Macintosh is that without a Windows emulator, such as Bootcamp, and an installed version of Windows, OziExplorer software doesn't work. There is a way to overcome this and that is to import the maps from the disc in .ecw format into a graphics program such as Graphic Converter, select the relevant part and then save as a PICT or TIFF file. Some of the .ecw image files are small enough to import directly into a mapping program such as MacGPS Pro. 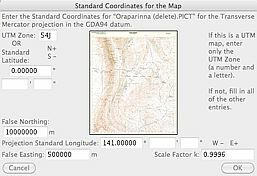 Often the .ecw image file will be accompanied by a matching .map calibration file and providing you keep it in the same folder as the ecw file, you can then import into MacGPS Pro and automatically calibrate the map. You could of course still do it the old way which was to scan and process a hard copy of the map. 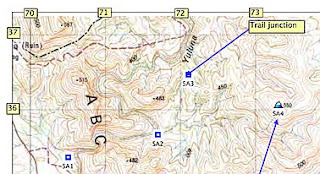 Assuming there is no matching .map file available, calibrating a digital map using MacGPS Pro requires that you first rotate the map (using GraphicConverter) so the northing gridlines are horizontal and then enter the full 7 figure grid references of four widely spread points, usually near the corners of your map. There are several programs (I use Skim) that allow you to annotate a pdf. This is particularly useful as it allows you to add grid references to the margins of your map (NB MacGPS Pro has a menu item "View/Gridlines" which does this automatically for you) and add notes about the route. Most programs allow you to add arrows showing routes and highlights. Once you have done this, you can export as a pdf and if you have the full version of Acrobat take advantage of its ability to reduce the file size significantly, to as much as a tenth. Google Earth can be used to visualize the route, finding 4WD tracks, checking whether creek lines are heavily vegetated and to see if ridges would be easier going. Cattle, goat and sheep tracks converging on a creek line probably indicates a waterhole, spring or a shallow crossing. Rainwater tanks, galvanised iron shelters, windmills and bores can sometimes be seen in Google Earth, even if they are not marked on the map. Simply import your .kml file showing your waypoints and then zoom in and tilt to see your route in 3D. Use a screen capture program, such as Snapz Pro X, to capture pics of significant parts of the route, with your waypoints shown. Save these to your iPhone, camera or print, for later reference while on the walk. One of the advantages of printing your maps from pdfs is that you can print them in A4 format which means they can either be laminated back-to-back or placed in a map case without the need for folding. Thanks for the posts. I have couple of thoughts on topo maps, probably not in disagreement with what you've said as far as I can tell. I think topo maps give far richer information than most other maps could hope to, and I feel awkward going on any significant trip without one. The first thought is that although I don't know what it's like in South Australia, but living in Victoria for the last 18 months I've noticed that topo maps here seem to be very scarce. This isn't through lack of information because obviously it's all been surveyed and the info's all there, but very few retailers actually seem to sell them. Sometimes outdoor shops have a small selection. Without knowing much upon arriving, it took me a lot of effort to discover that a standard official series of topo maps actually existed, and the only decent place I've been able to find that actually sells them, anywhere, is the government information shop on the 20th floor of an office building in Melbourne's CBD. It's not very accessible or advertised, and I've rarely come across anyone else anywhere who actually has a topo map besides me. There seem to be a lot of people relying entirely on dumbed down large scale park maps that show approximations of where to find walking tracks, and very little topography to go with it. The second thought is with printing maps. In New Zealand it's awesome under the new Topo50 system, and even if you can't or don't want to print maps, the way they've done the new series means they retail for about $8 or less in many shops, or you can bulk-buy 20+ maps for about $3.50 each, which is around the cost of printing. Self-production's becoming really popular in NZ as a consequence of the much higher availablity of data. eg. You can now use a site like this one to select any area in the country and create a printable 1:50000 rendition just of that space really easily. The concern I have, though, is that frequently when people print their own maps, they'll be printed at lower quality, they lose things like map keys and grid references (though the Skim application you referenced looks useful), they lose context of nearby areas that could be important if you get lost or need to change plans, and it ends up being a low quality map compared with what might be bought. It doesn't mean that it's impossible to responsibly produce a high-quality map, but to be safe I think it's often a good idea to pack some official paper maps, and at most use the cut down self-made renditions or iPhones or GPS maps for quick reference. Some people might frown at it as unnecessary weight, but for me it's certainly worth it. Yes the topo maps are detailed, especially if you can read the legend, but they lack the detail that Google Earth can provide ie individual bushes and individual wheel tracks. In addition, they are often quite old eg the third edition Oraparinna map in South Australia is copyright 1998, so the aerial photography is probably even older. Printing your own map does have its limitations as the paper quality is often poor as you indicated. There is waterproof paper available which prints quite well and is more resistant to folds. I agree that you should carry a full map even if it is convenient to use only the relevant parts while walking.